is a professor of biology at Stanford University in California. She has written about her research for publications such as Scientific American and Wired. Her latest book is Ant Encounters: Interaction Networks and Colony Behavior (2010). 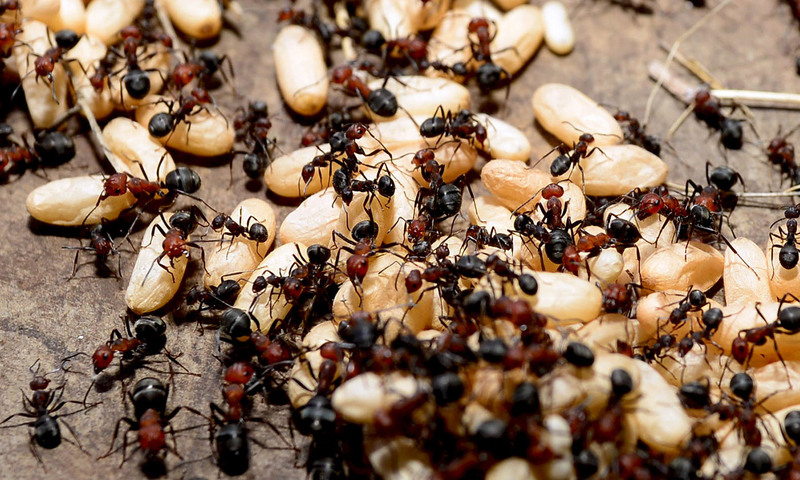 Like a brain, an ant colony operates without central control. Each is a set of interacting individuals, either neurons or ants, using simple chemical interactions that in the aggregate generate their behaviour. People use their brains to remember. Can ant colonies do that? This question leads to another question: what is memory? For people, memory is the capacity to recall something that happened in the past. We also ask computers to reproduce past actions – the blending of the idea of the computer as brain and brain as computer has led us to take ‘memory’ to mean something like the information stored on a hard drive. We know that our memory relies on changes in how much a set of linked neurons stimulate each other; that it is reinforced somehow during sleep; and that recent and long-term memory involve different circuits of connected neurons. But there is much we still don’t know about how those neural events come together, whether there are stored representations that we use to talk about something that happened in the past, or how we can keep performing a previously learned task such as reading or riding a bicycle. Any living being can exhibit the simplest form of memory, a change due to past events. Look at a tree that has lost a branch. It remembers by how it grows around the wound, leaving traces in the pattern of the bark and the shape of the tree. You might be able to describe the last time you had the flu, or you might not. Either way, in some sense your body ‘remembers’, because some of your cells now have different antibodies, molecular receptors, which fit that particular virus. Past events can alter the behaviour of both individual ants and ant colonies. Individual carpenter ants offered a sugar treat remembered its location for a few minutes; they were likely to return to where the food had been. Another species, the Sahara Desert ant, meanders around the barren desert, searching for food. It appears that an ant of this species can remember how far it walked, or how many steps it took, since the last time it was at the nest. A red wood ant colony remembers its trail system leading to the same trees, year after year, although no single ant does. In the forests of Europe, they forage in high trees to feed on the excretions of aphids that in turn feed on the tree. Their nests are enormous mounds of pine needles situated in the same place for decades, occupied by many generations of colonies. Each ant tends to take the same trail day after day to the same tree. During the long winter, the ants huddle together under the snow. The Finnish myrmecologist Rainer Rosengren showed that when the ants emerge in the spring, an older ant goes out with a young one along the older ant’s habitual trail. The older ant dies and the younger ant adopts that trail as its own, thus leading the colony to remember, or reproduce, the previous year’s trails. Foraging in a harvester ant colony requires some individual ant memory. The ants search for scattered seeds and do not use pheromone signals; if an ant finds a seed, there is no point recruiting others because there are not likely to be other seeds nearby. The foragers travel a trail that can extend up to 20 metres from the nest. Each ant leaves the trail and goes off on its own to search for food. It searches until it finds a seed, then goes back to the trail, maybe using the angle of the sunlight as a guide, to return to the nest, following the stream of outgoing foragers. Once back at the nest, a forager drops off its seed, and is stimulated to leave the nest by the rate at which it meets other foragers returning with food. On its next trip, it leaves the trail at about the same place to search again. Every morning, the shape of the colony’s foraging area changes, like an amoeba that expands and contracts. No individual ant remembers the colony’s current place in this pattern. On each forager’s first trip, it tends to go out beyond the rest of the other ants travelling in the same direction. The result is in effect a wave that reaches further as the day progresses. Gradually the wave recedes, as the ants making short trips to sites near the nest seem to be the last to give up. From day to day, the colony’s behaviour changes, and what happens on one day affects the next. I conducted a series of perturbation experiments. I put out toothpicks that the workers had to move away, or blocked the trails so that foragers had to work harder, or created a disturbance that the patrollers tried to repel. Each experiment affected only one group of workers directly, but the activity of other groups of workers changed, because workers of one task decide whether to be active depending on their rate of brief encounters with workers of other tasks. After just a few days repeating the experiment, the colonies continued to behave as they did while they were disturbed, even after the perturbations stopped. Ants had switched tasks and positions in the nest, and so the patterns of encounter took a while to shift back to the undisturbed state. No individual ant remembered anything but, in some sense, the colony did. Colonies live for 20-30 years, the lifetime of the single queen who produces all the ants, but individual ants live at most a year. In response to perturbations, the behaviour of older, larger colonies is more stable than that of younger ones. It is also more homeostatic: the larger the magnitude of the disturbance, the more likely older colonies were to focus on foraging than on responding to the hassles I had created; while, the worse it got, the more the younger colonies reacted. In short, older, larger colonies grow up to act more wisely than younger smaller ones, even though the older colony does not have older, wiser ants. Ants use the rate at which they meet and smell other ants, or the chemicals deposited by other ants, to decide what to do next. A neuron uses the rate at which it is stimulated by other neurons to decide whether to fire. In both cases, memory arises from changes in how ants or neurons connect and stimulate each other. It is likely that colony behaviour matures because colony size changes the rates of interaction among ants. In an older, larger colony, each ant has more ants to meet than in a younger, smaller one, and the outcome is a more stable dynamic. Perhaps colonies remember a past disturbance because it shifted the location of ants, leading to new patterns of interaction, which might even reinforce the new behaviour overnight while the colony is inactive, just as our own memories are consolidated during sleep. Changes in colony behaviour due to past events are not the simple sum of ant memories, just as changes in what we remember, and what we say or do, are not a simple set of transformations, neuron by neuron. Instead, your memories are like an ant colony’s: no particular neuron remembers anything although your brain does.